Liberal MPs shone a spotlight on mental illness and suicide Tuesday by launching a petition and tabling a motion in Parliament calling for a national suicide prevention strategy. Suicide is a leading cause of death in Canada yet there is no national strategy to prevent it or to help the families left behind, Liberal MPs said Tuesday as they launched a petition and tabled a motion in Parliament calling for a plan. Liberal MPs pressed the government on the issue during question period and made other efforts throughout the day to shine a spotlight on what they called a "silent problem" that still has a stigma surrounding it. The federal government needs to show leadership and co-ordinate governments of all levels, schools, workplaces and other stakeholders to develop a comprehensive strategy, Liberals said. "Every Canadian has been touched in some way by suicide. 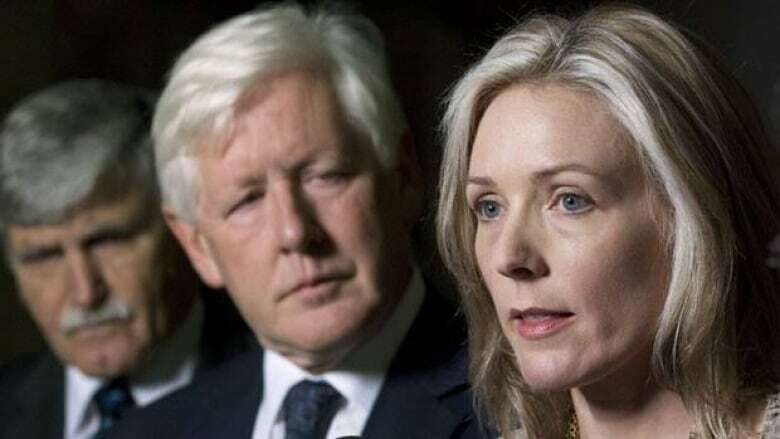 We have all lost friends and loved ones and we have all been forced to wonder why lives that seemed together and well-focused come to tragic ends," Liberal Interim Leader Bob Rae said in a statement. "But it's a stigmatized problem, and it's a silent problem. This has to end. Suicide is not just a personal tragedy, it's a key issue of public policy and facing up to it requires political will." Rae and a number of mental health advocates held a press conference on Parliament Hill where they presented stark statistics and described an urgent need for the federal government to take more action. Dr. Nizar Ladha, president of the Canadian Psychiatric Association, said the number of people who die every year from suicide represents "a very significant loss of life, and [an] untimely, unnecessary loss of life." More than 3, 600 are estimated to die every year from suicide in Canada. Ladha said a national strategy could help both those at risk of committing suicide and those left behind. "It's a form of death that leaves [an] enormous number of victims that suffer silently," he said. Suicide is the second leading cause of death among young Canadians and for that reason alone, suicide prevention should be a "national health priority," said George Weber, president and CEO of the Royal Ottawa hospital, a mental health facility. Forty-two per cent of young people do not admit to having a mental illness and while one out of five Canadians has a mental illness, only a minority seek treatment, he said. "We need to do much more in the area of health promotion, and suicide prevention and research," he said, noting that less than five per cent of research dollars are devoted to suicide. Mental health services are also underfunded and that's a major barrier to people getting help, said Karen Cohen, president and CEO of the Canadian Psychological Association. "Even those who ask for psychological help may not receive it because it is underfunded or insufficiently funded by private and public health insurance plans," she said. The stigma around mental illness is the second main obstacle to people reaching out for help, she said. Another advocate, Paul Links, said most countries have a suicide prevention strategy, but "Canada really stands alone." Liberal MPs said the House of Commons should put politics aside and work together on a strategy. Their motion calls for a national strategy, and funds to support it. During question period, Rae asked Prime Minister Stephen Harper what actions he planned to take in response to the motion. Harper said far too many Canadians are affected by suicide and that his government has taken steps, including the creation of the Mental Health Commission, to combat it. "Obviously, we will look at any specific ideas to see how we can improve on this particular national health problem," he said. Health minister Leona Aglukkaq said the government has also taken action to reduce the number of suicides among aboriginal Canadians. The rate is five times higher in the aboriginal population than the non-aboriginal population and the federal government has a national aboriginal youth suicide prevention program. Aglukkaq also said the government has made "significant investments" in mental health research and health promotion. The Liberals' "day of action" on suicide prevention comes after Conservative MP Harold Albrecht tabled a private member's bill last week that calls for a federal framework to be established to prevent suicide. The NDP has also tried to force the government to do more on suicide prevention. In 2010, MP Megan Leslie introduced a bill calling for a national strategy. This story has been edited from a previous version to correct the suicide numbers stated for Canada. There are an estimated 3,600 suicides per year, not 10,000 as stated in a quote in the previous version of the story.